Kenneth Eric Browne was born September 23, 1900 in Windsor, Nova Scotia, Canada. His father, Morris Brown, was born in 1867 in England and moved to Nova Scotia in 1890. His mother, Ada Browne, was born in 1871 in Germany and moved to Nova Scotia in 1890. His parents married in 1895 and had seven children, Whitman (b.1896), Clifford (b.1897), Hazel (b.1899), Kenneth (b.1900), Edmond (b.1902), Hilda (b.1903), and Margaret (b.1904). The father was a farmer. The family attended a Baptist Church. In 1911 the Canadian Census recorded the Browne family continued to live in Windsor, Nova Scotia, where the father worked as an Examining Engineer for a construction company. In June of 1915 at the age of fourteen Ken Browne completed the eight grade of public school and then began to study at an art school in Nova Scotia. In 1916 during the Great War he enlisted for military service, although he was under age. In order to qualify he claimed to have been born in 1898, which added two years to his age. He served in the Canadian Army Medical Corps and was stationed overseas. 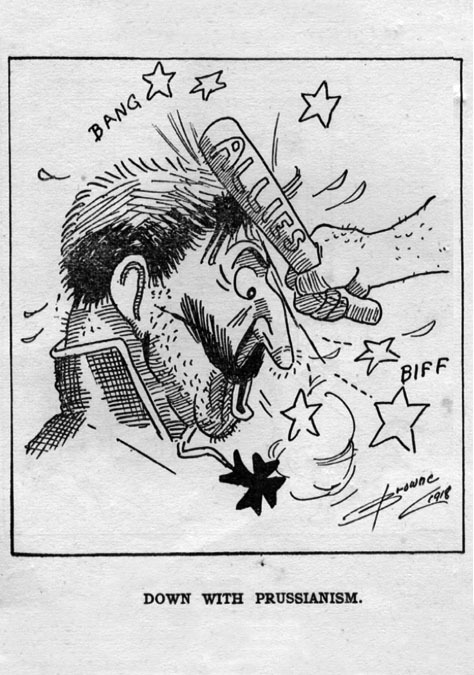 Despite serious challenges, he developed a happy-go-lucky attitude to entertain his fellow servicemen with playful drawings, portraits and bawdy cartoons. The Great War was his most formative experience. He was promoted to the rank of Corporal and honorably discharged in 1919. 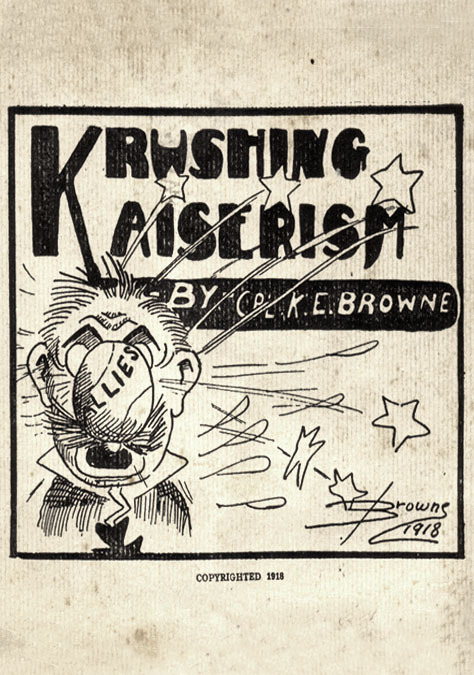 After the war he self-published a small joke book, Krushing Kaiserism, which included many of his overseas cartoons that had delighted servicemen. The sensational success of Capt. 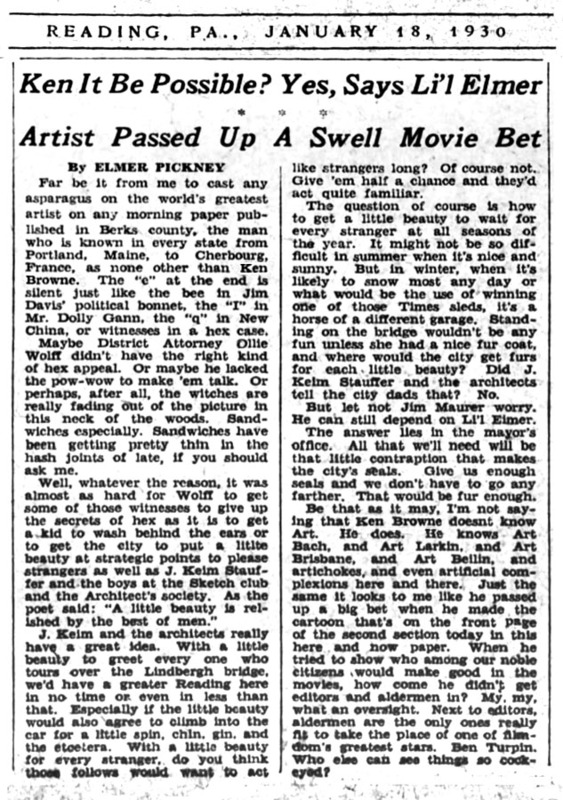 Billy's Whiz Bang encouraged Ken Browne to seek his fortune as a humorist and artist. In 1920 he left Canada and moved to New York City. He lived in a lodging house at 420 West 8th Street in the artistic community of Greenwich Village. He looked for work as a free-lance illustrator, but when his savings ran out he took a job as a hotel bell-boy. He continued to knock on doors and by 1927 he was a staff artist at The New York American newspaper, which was owned by William Randolph Hearst (1863-1951). 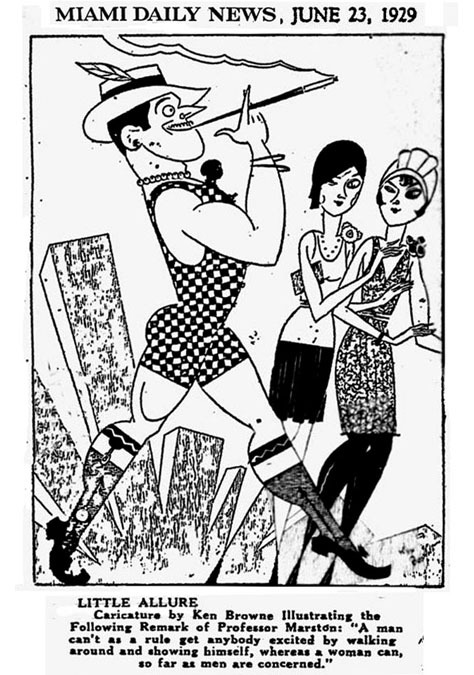 By 1928 Ken Browne was a staff artist on The New York Sun newspaper, which was published by Frank A. Munsey at 280 Broadway near City Hall. 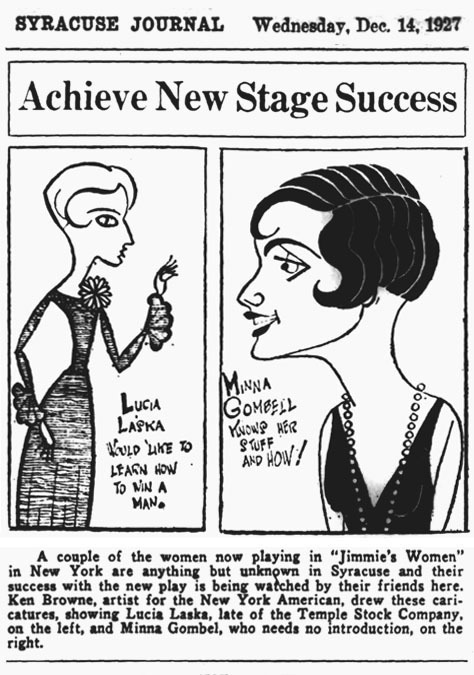 In 1930 Ken Browne moved to Reading, Pennsylvania, where he was a staff artist at The Reading Times. He drew several regular features including "It's All The Rage!" and "A Peek at the Week." He lived at the American Lodging House on the corner of 4th and Penn Street. In 1931, while living in Reading, PA, he married his wife, Iris Browne. She was a local telephone operator. She was born in 1908 in Pennsylvania, so she was twenty-three years old. Her highest education was the completion of the eighth grade. One of the most powerful figures in American newspaper industry at that time was Moses Annenberg (1877-1942). He was president of the Hearst newspaper syndicate distribution company and was also the owner of The Philadelphia Inquirer. 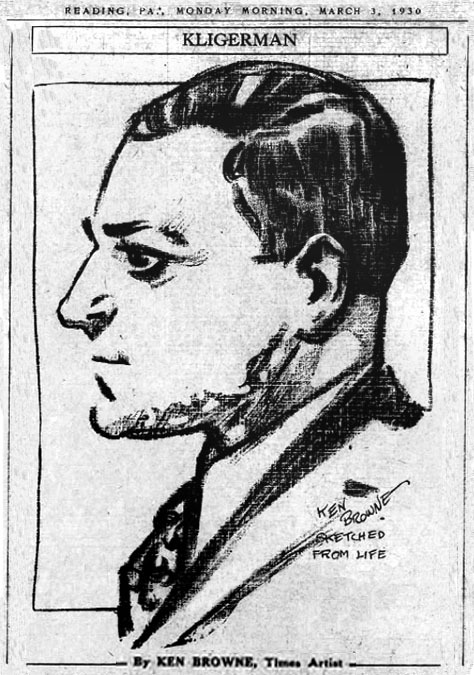 One of his many business affiliates was Theodore Epstein, the publisher of The New York Daily Racing Tab. By 1932 Ken Browne began a life long business association with Theodore Epstein as an art director and featured artist in most of his publications. Ken & Iris Browne moved to New York City an lived at 160 West 80th Street. 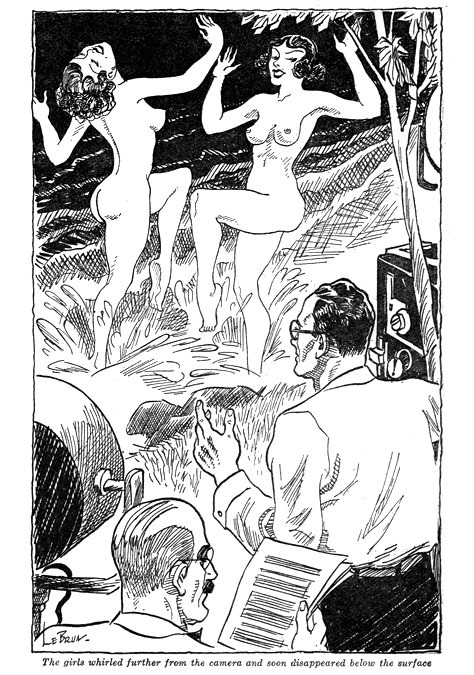 During the 1930s his illustrations appeared in many pulp magazines, such as Saucy Movie Tales, Easy Money, and Spicy Stories. 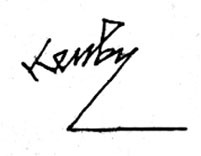 He usually left his work unsigned, but he occasionally signed with names that reflected his actual name, such as Kenby, Eric, Le Brun, Browsker, and Browken. He also used the names Toto and Zoto. By 1940 he listed his occupation as "free-lance artist," but he was also Editor of several humor magazines, Halt!, Army Laffs, Army Laughs, Army Fun, Laff Time, Broadway Laffs, and Pictorial Thrill, all of which were published by Theodore Epstein at 1790 Broadway or Bleier & Epstein at 1270 Sixth Avenue. He also drew features for comic books that were published by Bleier & Epstein. His work appeared in Headline Comics and Prize Comics. 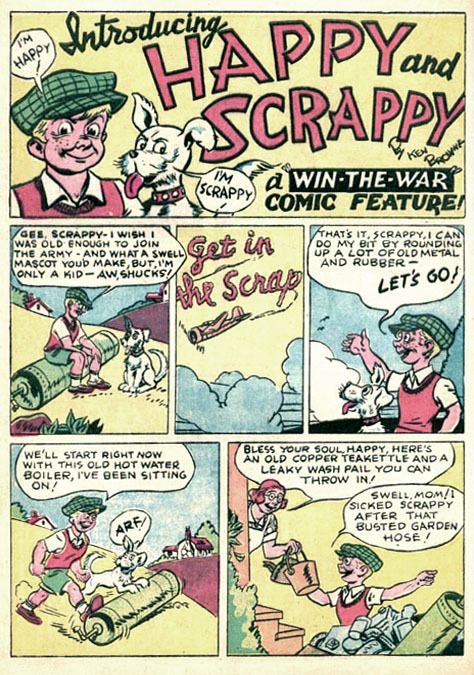 Ken Browne created an enduring comedy duo of comic characters, The General and The Corporal, for which he is most renowned. On February 13, 1941 as storm clouds of war gathered over Europe, Ken Browne sent the following editorial contribution to his old friends at The Reading Times, "The Veteran. You'll find him standing near you, as we go marching by. He joins you in the cheering, as you praise us to the sky. We well know what he's thinking, as you cheer us on our way. It's of the day when he joined up, when life was young and gay. T'was over twenty years ago. How swiftly moves the time! He wonders why they've passed him up, 'cause he's just in his prime. He'd like to join the march again. He might be feeling fit, but a nation calls the young ones, when it's time to drill a bit. Forget not how he soldiered. He made a gallant stand, with Uncle Sammy's doughboys, in a far and distant land. So hats off to the veteran. Give him your praise and cheer, as we are merely off to camp to train for but a year!" Eight months later the fateful sneak attack at Pearl Harbor changed everyone's plans. 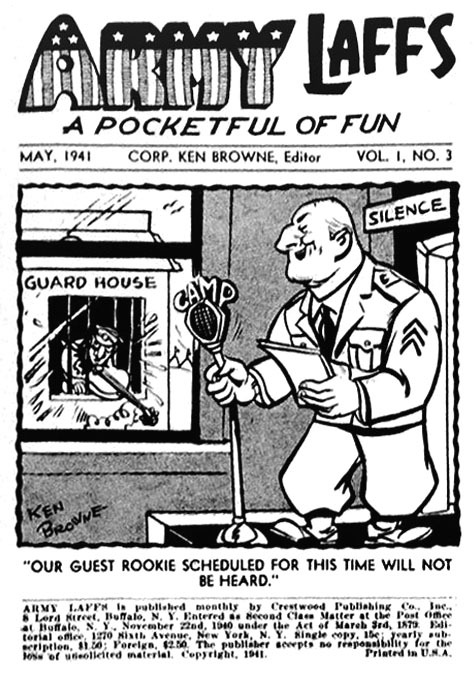 During WWII Ken Browne was to old to serve in the military, but he revisited his creative origins by contributing drawings to Army Laffs under his old title, "Corporal Ken Browne." That was the same way he had signed the drawings in his 1918 gag book from The Great War. 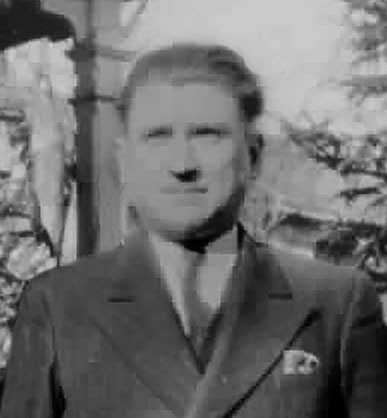 During the 1940s Ken Browne was identified in several issues of Writer's Digest and The Author & Journalist as the editor to whom aspirant writers should address their submissions. 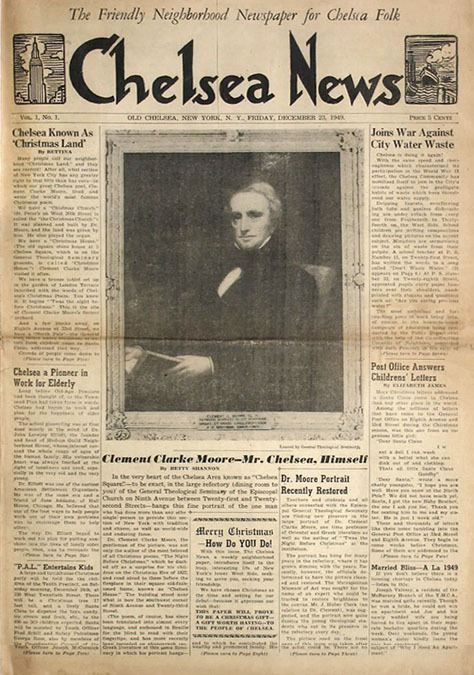 At Christmastime in 1949 Theodore Epstein started a new NYC newspaper, which he called, The Chelsea News. The masthead featured hand lettering and decorations by Ken Browne. 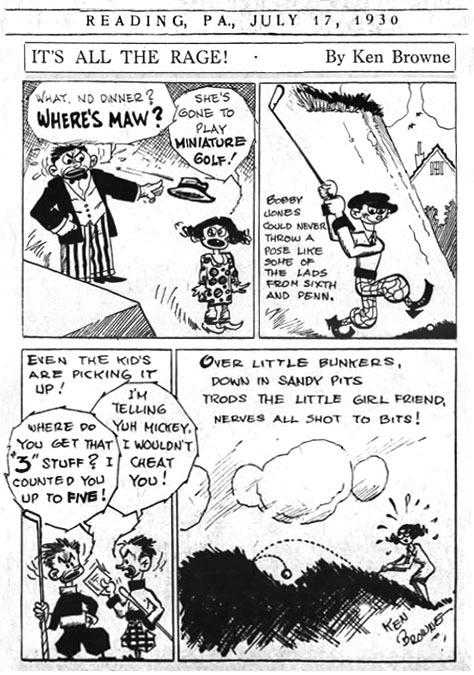 During the 1950s and 1960s the Korean War, the Cold War, and the War in Vietnam continued to produce new generations of military recruits and veterans, and their entertainment was the dedicated aim of Theodore Epstein's digest magazines filled with ribald cartoons by the Editor, Ken Browne. Ken Browne died at the age of sixty-four in a Manhattan hospital on May 8, 1965.